Preorder for your desired ship date! Bidens (tickseed sunflower plants) are sun-loving annuals with fern-leafed foliage and bright yellow flowers. These plants bloom continuously and are self-cleaning. They are suitable for landscapes and mixed containers, and since they like moist soil, they can create a cover for bare, open areas such as ditches. One thing your customer may love about Bidens is that they self-sow. Bidens also attract pollinators and butterflies, blooming from July to October. For best results with Bidens, we recommend using a constant feed program of 150-200 ppm N. Maintain a pH between 5.8 - 6.2. For Giant White we recommend one pinch 5-10 days after transplant, once the roots are established. Bidens should be spaced adequately to allow airflow and light penetration between the foliage. Usually 2' centers on baskets will be enough. Plant growth regulators are optional with Bidens, though not necessary under high light intensities. 1-3 sprays of ALAR (B-Nine) 2 gr/L according to required plant size. 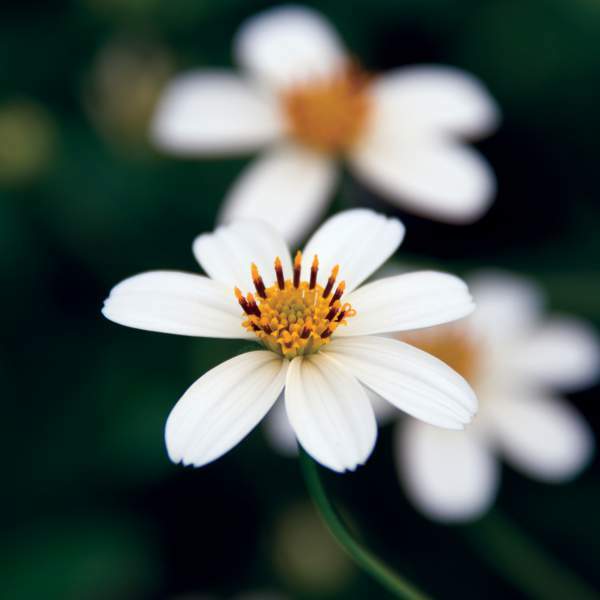 Whiteflies, aphids, and thrips are common pest problems with Bidens. Giant White are not prone to many diseases, but watch for botrytis while the days are short. This grey rot is usually associated with wet or humid conditions. You can prevent botrytis by allowing the plant to dry out between waterings, allowing for good airflow in your greenhouse, and spacing to allow the sun to penetrate to the soil level. The most common chemicals used to treat botrytis are Medallion and Banrot. Use them as a drench according to each label’s instructions. We recommend planting 4-5 starter plants per 10 inch basket. Use a well-drained soil in your baskets and plant your starter plants deep, allowing the ellepot to be completely covered by the soil. If you are planting 4" pots, 1 plant per pot should be sufficient. Plant it directly in the middle of your pot. Pinch Giant White 5-10 days after transplanting to your final container.